Last year I ordered about 9 different dwarf iris rhizomes. I was out of town when they arrived, so I asked my husband if he could heel them in until I had a chance plant them. They stayed there all winter as I didn't get around to moving them. Even thought they aren't in a permanent location, it hasn't stopped these jewels from blooming this spring. They range between 5" - 10" in height. 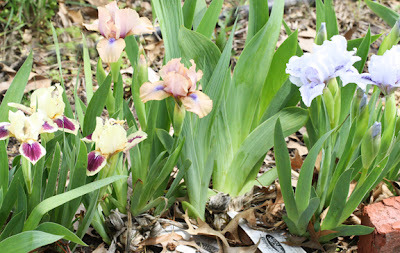 These petite iris are one of the first flowers to bloom and come in many colors. They are just too cute! I don't think one can have too many of these. The great thing about these small wonders is they do well just about anyplace. They are perfect for the front of a border, a rock garden, an edging or in a container garden. Their only requirements are water, soil that drains well and some sunlight. After a year or two there will be plenty of rhizomes to share. Divide and transplant them after they bloom. My grandmother grew a field of iris for her floral business. (I'm not kidding when I say she had a field of them either!) She was especially fond of one variety with a huge purple bloom that grew on a 40" stem. I have some of them in my garden too....but they are not my favorites. I only grow them because she shared them with me and because of my love of her. Just when these huge flowers are in their glory, a strong gust of wind and/or rain can bend the stem to the ground. Here in Kansas we have those storm events every spring, and I just can't get too excited about flowers laying in the dirt. I've never found these sweet blooms on the ground. They always look perky and upright. You can see each plant still has the tag so I know it's name. Each day I'm out to photograph them to record their colors. I think it will help when I transplant them. It probably won't matter though. I have found I'm a careless gardener. I just mix flowers in where ever I find a good space. Mine were purchased from Schreiner's. Wishing a Happy Mother's Day to all Mom's on Sunday! Wonderful irises, the Schreiner's is up the road from my house, I went by the field the other day and it beautiful right now. Years ago my friend walk the road each day and pick up bulb that fell of the truck. So I have a few in our yard. Have a wonderful mother day. The dwarf iris are so pretty. I have them on my wish list and want to plant some in the fall. Thanks for "sharing" yours. Lovely! 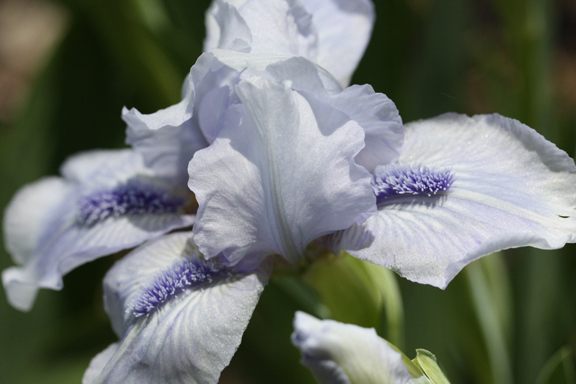 Do you happen to have any of the lavender irises that smell a bit like violets? We had some on the farm where I grew up, and I will never forget that spring fragrance despite the fact that I've never again found any! What a sweet post, beautiful flowers. your iris are totally out of this world gorgeous! Wish I could see those fields and attend the Iris Festival. My iris are still in bloom. They are so sweet. After writing the blog post, and looking at the Schreiner's catalog again I ordered about 6 more. I need to stop the madness! 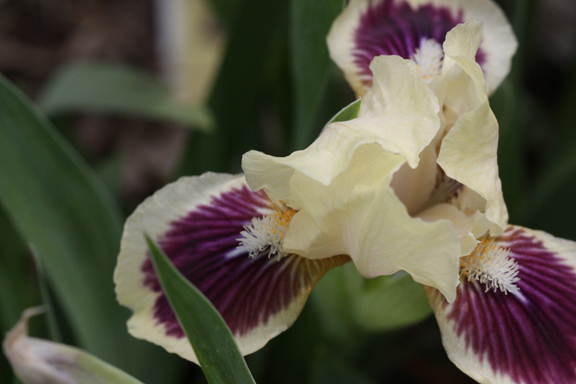 Thanks for sharing the beautiful Iris! I have been wanting to order some and appreciate your link. I am sure those will be wonderful in Nebraska, as well! I particularly love the blue one. It is absolutely beautiful (well, they all are, but I especially am drawn to that one). I'm really sorry but there isn't a pdf of the pattern right now. It might be something I can get done this fall....but right now I don't have a chance to get the pattern redone. Barb and I are working on several other projects right now. I will announce it on the blog when the project is finished. I think growing the purple irises is a wonderful way to honor your grandmother. 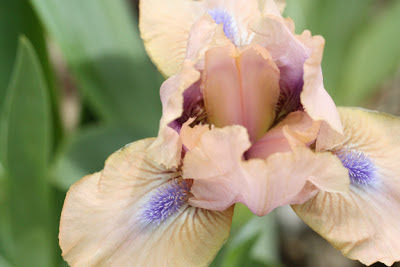 The picture you have at the beginning of your blog is my favorite picture of an iris. I happen to think they are wonderful flowers that can go anywhere.